Every culture has its own type of community hangout, from the pubs of England to the izakayas of Japan. But what of multinational Hong Kong? Do Irish pubs and shisha bars in LKF resonate with the community? Not so much. Mitte seeks to remedy that by being an osteria-style hangout for Sheung Wan. Founded by three friends who originally met in Berlin, only to cross path years later in Hong Kong, Mitte claims it is not just about drinking, but also chatting over a meal into the night. Based at the mouth of Upper Station Street and opposite the famous Upper Modern Bistro, it’s a small space with bare concrete floors and walls adorned with vintage posters of erotica. A laid back eatery, a DJ booth is used on Friday and Saturday nights to create a livelier vibe. Mixers predominate on the drinks list, which is no surprise since the owners have secured exclusive rights to Negroni brand bitters and are keen to make the most of them. The food menu follows the Italian format of starters, pasta, mains and desserts. To start, we plump for a ‘buff’ ($178). 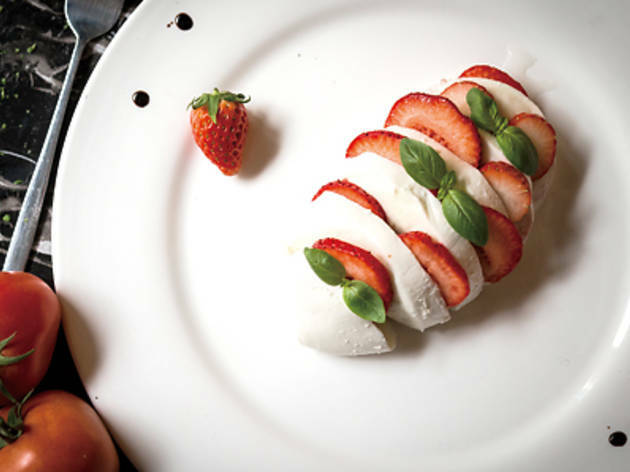 Made with authentic DOP buffalo mozzarella, the cheese is generously sliced and interspersed with strawberries, basil and balsamic vinegar. 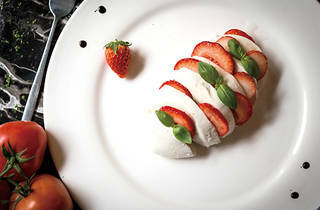 It’s a refreshing way to reinvent a caprese salad, with the strawberry adding aroma to the dish. A strong sense of community certainly exists between the patrons at Mitte, with many who say hi to each other. Even the wait staff greet their own friends – it’s a nice touch that almost comes at the price of the service. Our gnocchi con vellutata di zucchine e gamberi (gnocchi with cream of zucchini and shrimp, $188) takes over 20 minutes to arrive. It’s delicious though. The combination of courgette and shellfish is a unlikely approach to gnocchi, a dumpling that’s usually paired with richer sauces. For sweet, we opt for the nutellina ($78), fried pizza dough slathered in Nutella sauce, garnished with crushed nuts and strawberries, but it’s another 20 minutes before it arrives. We enjoy its comforting flavours, but expect for more after such a wait. Mitte 1A Upper Station St, Sheung Wan, 2803 7080; mitte.com.hk. Dinner for two: $800.